After years of trailing the Chinese and Japanese, the United States now has three of the four fastest supercomputers in the world. 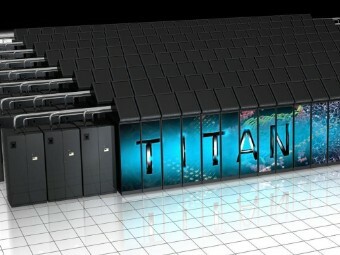 Titan, the U.S. Department of Energy's top open science supercomputer, was officially crowned the world's fastest computer on Monday. The computer scientists and engineers responsible for the semi-annual "Top 500 List" of fastest supercomputers tested Titan, which came online October 29, just before the deadline for the November rankings. The new supercomputer, located at the Oak Ridge National Laboratory in the Tennessee Valley, is capable of 17.6 petaflops (quadrillions of calculations per second). It was a close race for the top position: Titan outperforms its nearest competitor by just over a petaflop. Titan's ascendency to the top of the supercomputing world puts the Department of Energy back in a position it's accustomed to. Jaguar, Titan's predecessor, was the world's fastest in 2010. Today, Jaguar would have placed tenth -- Titan is 10 times faster. That's how quickly things change in the supercomputing world. With Titan making the jump to the top, the United States is now firmly back on top of the computing world after ceding ground to Japan, China and Germany over the past three years. That's not just a badge of honor: It's also critical to national security and the country's economic viability. Titan will help U.S. scientists pioneer research into climate change, biofuels, nuclear energy, new materials and other crucial fields, which will help them create the next wave of car batteries, switchgrass ethanol and improved weather forecasting tools -- all developed in America. The United States has 251 of the 500 fastest supercomputers in the latest list.